When the atmosphere and the discussions join the reflection, the bets and the bluff. The progressive discovery of information will guide your choices on the cities to control with your gang. At the end of each round, if you are a majority in a city, you can enrich yourself or suffer the inconvenience due to your imprudence. Only at the head of your gang, deduction, bluffing and taking initiatives will be essential. 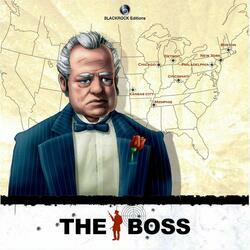 A 6 players, teams of 2, cunning and deceit will also be valuable allies to become "The Boss".